Wow, thank you for all of your lovely comments on my last post… New Zealand is such a beautiful country and I do love sharing the special bits of it with some of the rest of the world! The crochet and knit community anyway! And yay, I felt pretty spesh after reading some comments about me learning to knit in the round… I’m slightly addicted to this right now, but more about that another time! 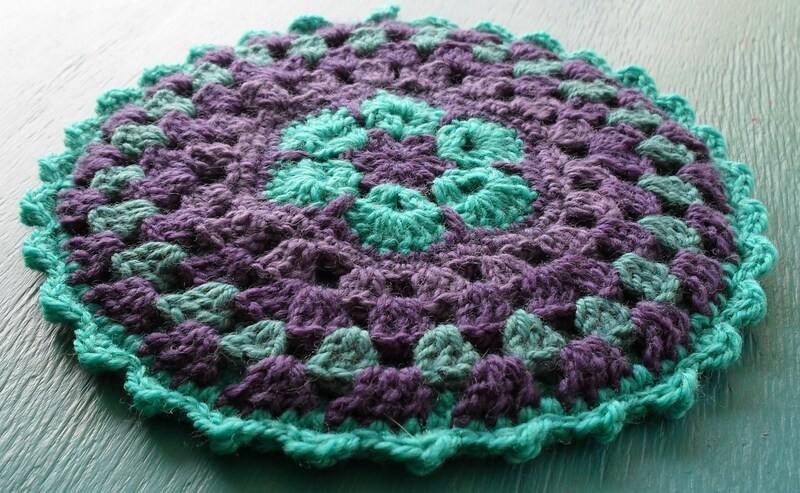 Today’s post is about colourful, fabulous crochet…. 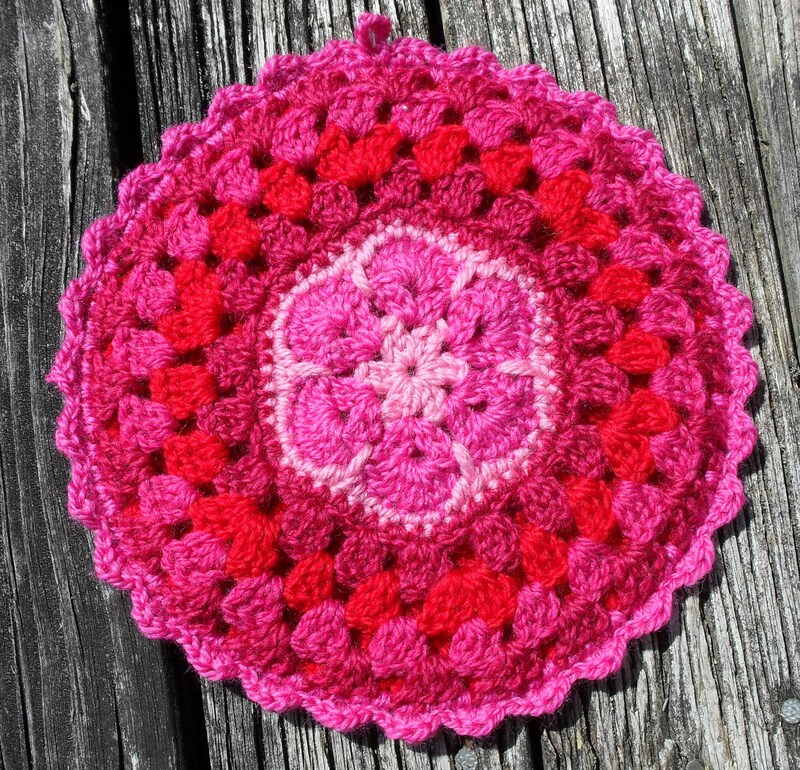 Crochet I’ve been dying to show you since the start of the week but wasn’t here, so have been WAITING to post, and that has been hard!!! As I had quite a bit of time at KB’s parent’s house to sit out in the sunshine, (oh bliss, the weather has been dreadful in Wellington) I made the most of my relaxation time and spent a lot of it crocheting pot holders! This was quite a curious thing to her family members but they seemed to adore the results, and I’m quite pleased with them too! So I’ve prepared a wee tutorial for you, if you would like to make your own…. but first let me show you a picture…. An African Flower turned mandala… I love it deeply….. So if you would like to make one too, quickly click here and a little box will pop up with the pattern for the african flower. This is the pattern by Lounette Fourie and Anita Rossouw and full credit for the beautiful and highly popular motif of course is theirs!!! (the ravelry pattern page is here!) So I made these with 8ply wool and a 4mm hook. For the back. I used a 5mm hook to save time and wool, and it hasn’t affected it, just be careful when you hook them together that you don’t end up with bunching…..
Make one african flower, but don’t make the last edge with dc. Once you have made the flower, edge it with 1sc into each stitch, EXCEPT the “middle” (the tallest part of the petals) of each petal, make 2sc into this stitch. When you have completed the round, join with a slst into the 1st sc, then ch3 and 2dc into the same stitch. Ch1 and skip 2 stitches and make 3dc into the next stitch, ch1, skip 2, make 3dc into next stitch and so on and so on until you have completed the round! In the next round, change colour and join new colour with a slst into a 1ch space from previous round. Into the same space, make 2dc, ch1, 3dc. *Ch1, 3dc into next 1 ch space, ch1, 3dc into next 1ch space, ch1, into the next space 3dc, ch1, 3dc* Repeat ** until you have completed the round, then ch1 and join with a slst to the 3rd ch of original 3ch. In easier-to-understand language, you want to make a “granny” (3dc cluster) twice, then 2 “grannies” each separated by 1 chain for this round. I hope this photo is helpful for you to see that… the colours are a bit “samey” to really see the difference in the rounds, sorry about that! For the next TWO rounds, join new colour with a slst into a 1ch space and ch3 (counts as 1dc) 2dc into same space. ch1, 3dc into next space and continue until the end of the round. ch1 and join with a slst to the 3rd ch of original 3ch. Coolies! You’ve just finished the front!!! OK so now you need to make a back and I did this by making the typical dc circle. Make a magic ring (tutorial here if you’ve never seen how this is done) ch3, 11dc into ring and pull tight, join with a slst to the 3rd ch of original 3ch. ch3, dc into same stitch, 2dc into each stitch for the entire round, join with a slst to the 3rd ch of original 3 ch. ch3, dc into same stitch, dc into next stitch, 2dc into next stitch….. until end of round, join with a slst to the 3rd ch of original 3ch. Continue in this fashion, each round increasing the number of single dc’s between 2dc’s as the circle grows. e.g. next round will be 2dc into one stitch, 1dc into next two stitches…. next round will be 2dc into one stitch, 1 dc into next 3 stitches… until the back is the same size as the front. Now hook them together with a 4mm hook! I used sc and at the end of the round join with slst to the first sc. Now ch1 and slst into the next stitch, into the next stitch make 1sc, 1hdc, 1sc, slst into the next 2 stitches, then into the next stitch, make 1sc, 1hdc, 1sc…. continue until end of round. Now ch as many stitches as you want to make the hanging loop (I did 6) and slst into the same stitch to join the loop. And there you have it! Weave in those ends and voila! I am sooooooooooooooooooooo loving these right now! As I said, I made more than a few on my trip to Turangi…. And of course, a rainbow…. And this lovely one which I gifted to a colleague yesterday as a house-warming gift which she LOVED! I think this is what the offspring of enlightenment and retro kitsch would look like…. beautiful mandalas hanging above the stove…. So we decided it was an “ornamental” pot holder! I lust love these so much… these ones all have future homes as christmas presents or other gifts, and I’m quite glad because I get to make some more!!! I hope you have fun with these too and make sure you send me a link so I can come and visit you and enjoy your creations too! Do you know what? I had a car accident today….. It involved a car and me…. I went for a run this morning, and halfway home I was running along and a lady opened her car door and I smashed into it…. Oh my god…. what a fright, and the pain! I appreciate it was an accident, but it happened so fast, she managed to get her door open about 30cms and I didn’t have time to stop, so before I knew what had happened I had smashed into the corner of her door, with full impact hitting my right shoulder and right wrist. I have to admit I’m feeling pretty bad about how I reacted….. being tired and in a bit of shock, I kind of fell against the fence and then started to CRY and just ran away! Aaaaaaaah! How embarrassing! I’ve got a big graze and bruise on my right shoulder where the corner of the door got me, and to tell you the truth, I’m a bit nervous about the impact this might have on my crafting when I wake up tomorrow morning! I’m hoping it doesn’t stiffen up and render me unable to carry on with this knitting in the round business I am compelled to attend to daily! We shall see…. I’ve broken through the pain barrier before with knitting, I’m sure I can do it again…. OK, complaining over and done with…. the last matter to attend to in this post is for Bianca and Amanda who both spied a crystal hanging around my neck in the last post and wanted close-ups!!! Luckily, when I was in Turangi I took it off and cleansed it in the icy waters of the Tongariro River, then snapped a picture of it in the sunlight….. I learned that sunshine trick from Amanda…. 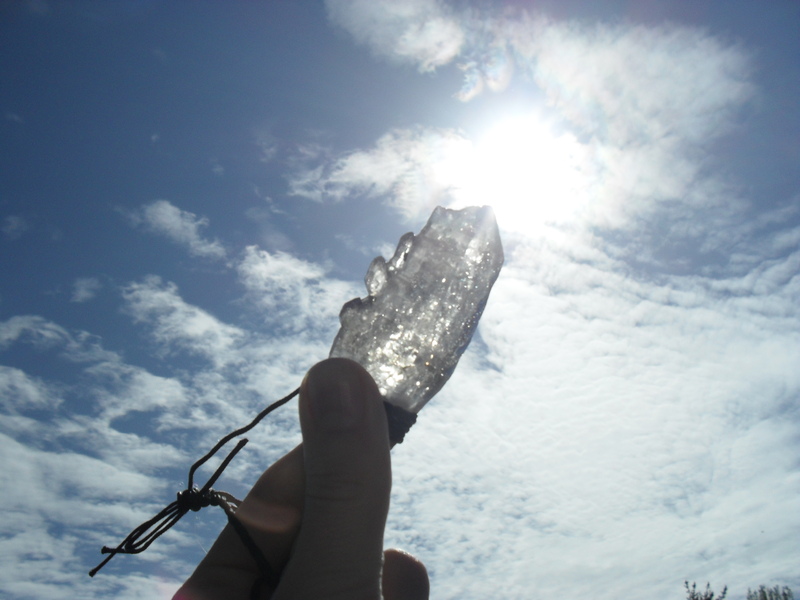 here is a close up of one freshly cleansed elestial smokey quartz which I am lucky enough to wear…. It’s quite amazing as it looks like a key to a very special spiritual door…. Now I’ve shown you mine, you show me yours! I’ll be checking your blogs, both of you for some crystal goodness!!!!! OK Lovelies, I’m off to do some…. something….. I’ve actually finished all of my projects so I have a clean slate! FUN! Have a beautiful day wherever you are and whatever you’re doing! I'm a crochet obsessed, reiki master, crystal healing, yoga junkie, counselling student, in a happy long term relationship... and Raymond's mum! 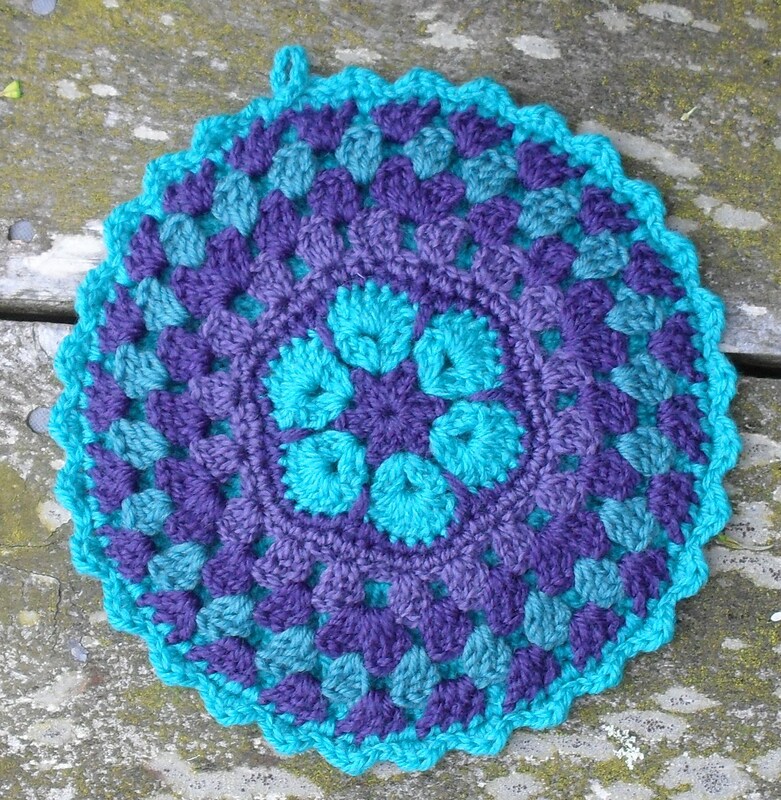 This entry was posted in African Flowers, Colour Therapy!, Crochet Goodness, Crystals, Other Ramdom Stuff, Patterns, Pot Holders!! !, Rainbows!. Bookmark the permalink. 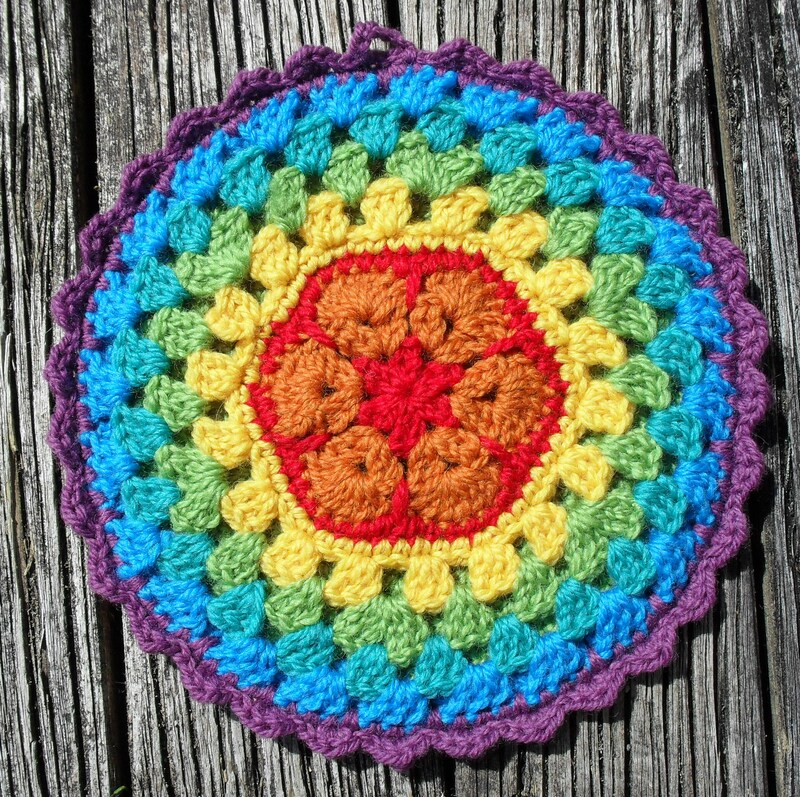 75 Responses to “Ornamental” Pot Holders! Hello Alice! I hope you are alright and not much in pain! KB was right! So beautiful potholders! I haven’t any with yarn because I couldn’t leave them in the kitchen – but perhaps somewhere else for decoration! I love the purple and turquoise one the best. You could stuff the middle with potpourri for a hot mat, with scent. Thank you for writing up the instructions, I’ll have to make some of these. I do hope you’re not hurt too bad from your accident. Oh to have a clean slate! I do hope your injuries get better soon and I agree-exerciseis BAD for you! I love the ornimental pot holders, they are so Zingy! Oh Alice I hope your bumps and bruises heal quickly. 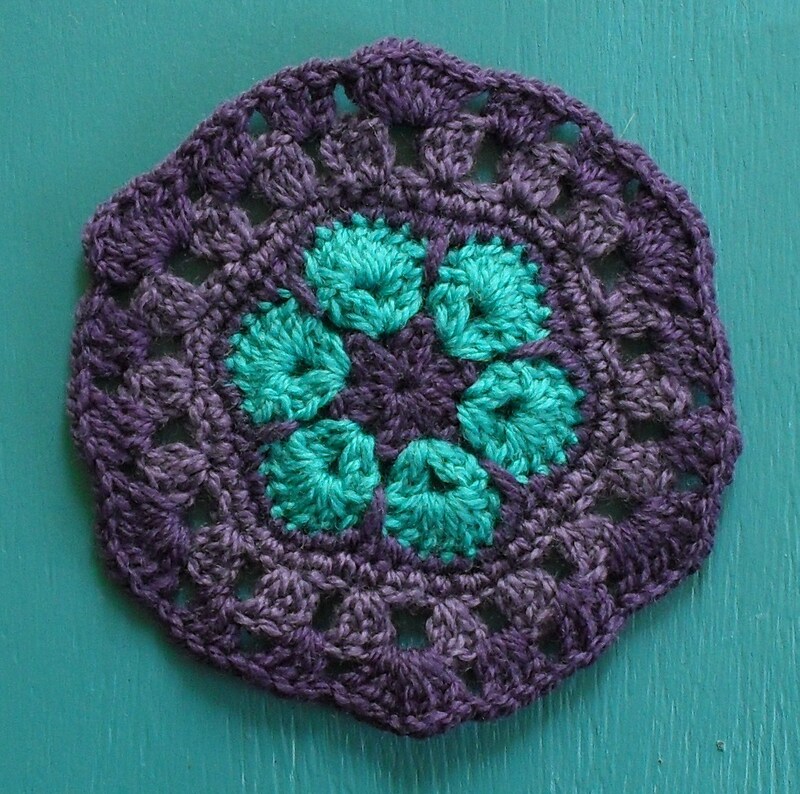 I prescribe crochet and tea – a winning combination for many ailments. Your pot holders are wonderful. 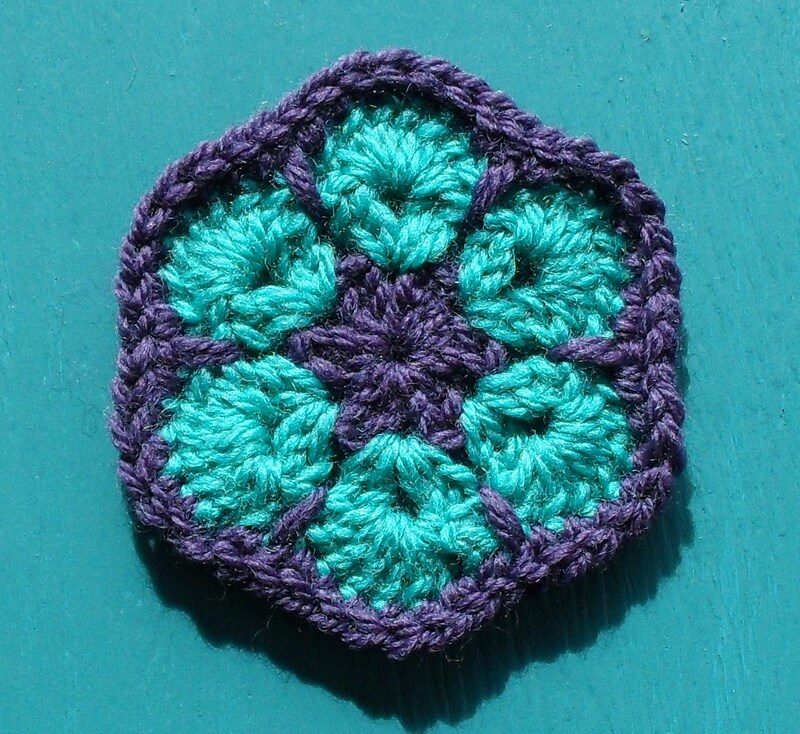 I have seen many here and there around blogland and your have finally inspired me to have a go – particularly because today I am away on my holidays for a week to the middle of nowhere with plenty of crochet to do. Alice, ouch! Hope you are feeling ok tomorrow. Your pot holders are just lovely. Not sure I could use them as potholders tho, they are way too pretty. Take care of yourself and have a lovely weekend. Alice, I’m so sorry to hear about your accident! Owie – that sounds like it hurts so much. I have a feeling I would’ve reacted in exactly the same way. I absolutely love your potholders. The rainbow one is like pure happiness! I’ve been playing around with the African Flowers pattern lately and I’m really enjoying it too. Oh dear Alice you poor thing, I do hope that the grazes heal quickly and you don’t feel too stiff in the morning. Sending you many healing thoughts. The potholders are just glorious… I had to laugh at the exchange between you and KB about not using them for real… Tim and I have similar discussions sometimes and he just doesn’t get the whole “ornamental” thing! As for the crystal, well, WOW… that is a beautiful piece and I am glad to see you have been caught by the sunshine photography taking :o) I have, as requested, posted about a crystal new to us, but we have no sun today and so it is rather gloomy in comparison :o( but I shall endeavour to get many more shunshiny photos soon! Oh dear Alice, I think I might just have to agree with KB and exercise being “bad” for you, hope you are feeling better soon and there is no residual soreness to stop those fingers working! Thanks so much for sharing the tutorial… can’t wait to make a few of my own.. The “potholders” are beautiful. I’ve decided that you (like me) carry around a tote full of yarn. Car guy thinks it’s nuts, but I start feeling antsy if I have free time and empty hands. I hope you recover quickly. I personally agree with KB because every time I try to exercise and “be healthy” I manager to hurt myself. Have a wonderful week-end and feel better soon!! Your pot holders are an absolute joy! What deliciousness for the eyes and what lucky recipients. I’m hosting a ‘Splash of Colour’ week next week to help to fend off winter blahs. 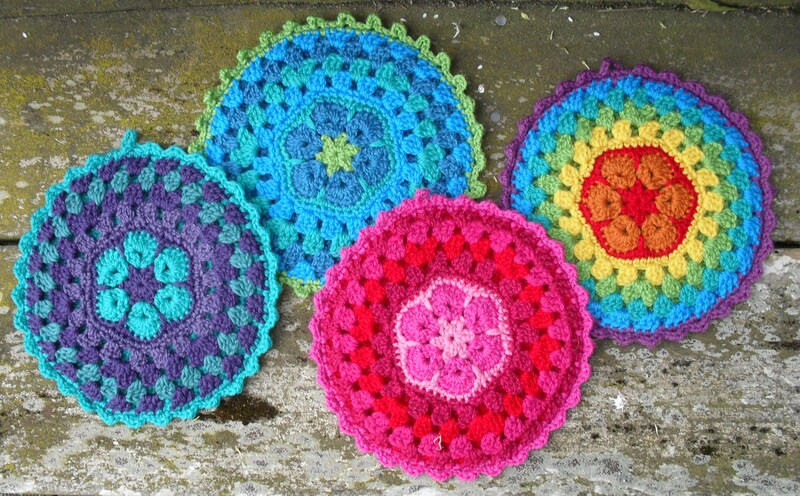 These are so vibrant – we’d be delighted if you joined the flickr group and posted some of your beautiful crochet. Fingers crossed. Your crystal is rather beautiful too – at first I thought it was an icicle. Ouch – horrible bad car! Hope your shoulder is feeling better and you can knit and crochet to your hears content. It must have been quite a shock, a car door suddenly coming out of nowhere, very bewildering; so I think you could forgive yourself the tears – it must have hurt awfully too! (I run off to bed whenever I hurt myself at home, my safe place I guess). Love your pot holders, I do enjoy your colours. Now I really do need one, when I whisk all my soups with my whizzy stick I have to take the pan to the stick as the lead is not long enough and really I need a pot holder to rest it on. Would have to make it just a tad ugly so I wouldn’t mind if anything bad happened to it. Oh dear that list is growing, best get off the computer and get on with it! I love your potholder! You have given me inspiration for my “Something New Saturday” project. I try to do something I’ve never done before on Saturdays, and my husband is begging me to stick with crochet (I have many other craft interests, but crocheting is my no. 1.) 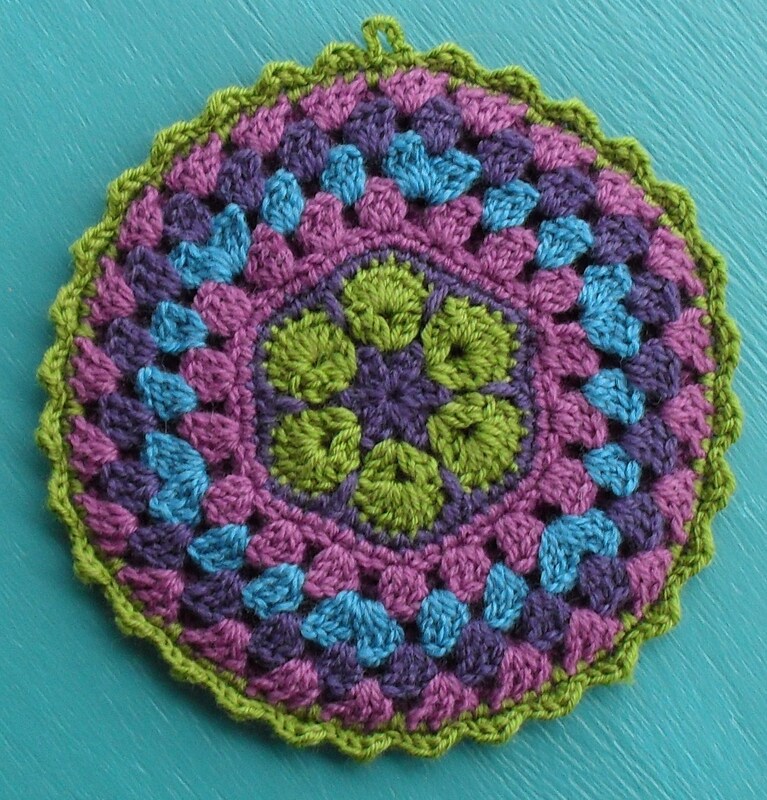 I’m in need of some handmade potholders, and this will give me a great start. Do you recommend cotton yarn for usable potholders, or does it matter? OOh gosh I am upset reading about you and your accident. I think you ought to go and get yourself checked out when you can. I bet you wont do that again! Now I have to say a big THANK YOU! because your lovely gift arrived today. OOh mygoodness I was pr0perly spoilt. Your bunting is absolutely gorgeous and I will be putting it on Mrs Twins when I have time. I am all behind today! I loved the card, the hearts, the little ‘giving’ card, and the little heart. I’m just so happy. I loved too the ‘paper’ you wrapped it in, beautiful idea. Thank you so much. I honestly dont know how you find the time to do these wonderful tutorials, I am sure everyone will agree with me, they are superb. I just wish I had time to have a go but I am so busy with my Blankets for the Elderly. I shall be posting my new one late tonight, or tomorrow, so please pop over. Lovely!! I think this might just justify me buying my yarn to my OH, as long as I don’t tell him up from they are ornamental! They are honestly far to lovely to actually use. Happy weekend to you, KB and Sir Raymond. Ouch !!!!! Feel your pain. Got a safe park for running close by? Can’t have you damaging your crafty bits. Thanks for showing your beautiful potholders. Have a great weekend. You do live in an amazing part of the world – next to Aus that is. We’ll be back over there soon I hope. Loving the pot holders, love the idea of popping some potpourri in there, the colors are amazing once again. I LOVE your crystal, I used to have a couple of crystals hanging in the window and when the sun shone through them I would stand in the crystal lights that they gave off and close my eyes and just be. It felt very soothing. This is reallly realllllly realllllllly beautiful! Thanks for sharing with us! ouchey-waa-waaa! hope your shoulder is ok! Get some arnica/comfrey onto it and some kisses to make it better. I’ll charge up some points and send some energy your way today. what can I say … love them, love them, love them! And the colours are fantastic!!! OUCH! Hope you are ok! Your potholders are fabulous! And I adore the cushion you made. I have some projects I have to finish, but that cushion is going on my list!!! hi, love the pot holders! i will have to give those ago sooon! love the a f hexys they are fun to make and easy once you know how! sue ~n.z. Well after your original post, I’m finally finding my way to you! What a beautiful project. 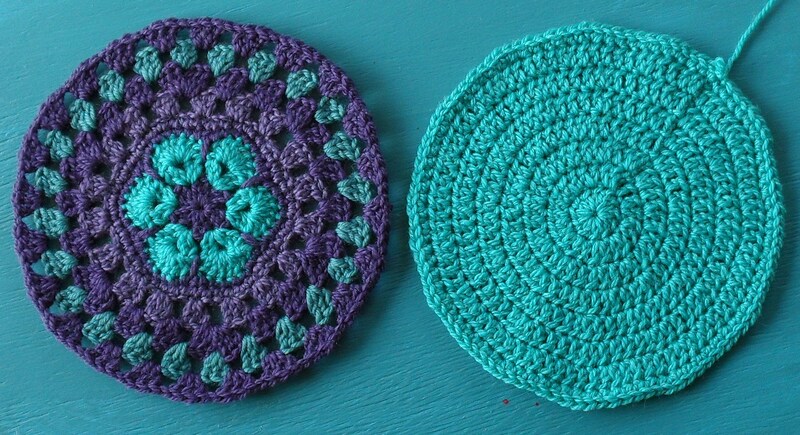 I’ll be giving these potholders a whirl today! Exciting! And I love all of your colors! Thanks for all you share. I’ve been watching your blog “silently” for awhile, but now have a blog of my own and will be a bit more vocal about my visits! Have a wonderful weekend! Thank you for your inspiration! I love these african flowers and I really love the colors you use! I’m definitely going to try your tutorial! I like your african flower. Lounette Fourie and Anita Rossouw are the from South Africa? These are so cute. Can’t wait to try to make one. Pingback: Another Baby Blanket! « Goats and Hounds! Pingback: Potholders! « Goats and Hounds! Thank you so much for a very fun and inspiring tutorial. Beautiful!!!! I made two of this 🙂 Thank you so much for this tutorial. Thank you for the wonderful tutorials. I am thinking of opening my Etsy shop next year focused on selling my knitting, sewing and illustration pieces. A crochet pot holders piece I am thinking of selling is inspired by your African flower pot holders. Since I got the basic idea for my product off your site, I was checking to see if it would be okay if I sold my product based on your design on my Etsy shop. On the product page, I would be sure to mention the product’s design was inspired by your design and provide a link to the source. You can contact me at maysfactory@gmail.com or reply below. I look forward to hearing from you. that is fine, I do not mind if people sell things made from my tutorials and patterns as long as they do not sell the pattern and share where they got the pattern from to encourage the sharing nature of these patterns and this blog. Hi, I just found your site, and I really do like what I’ve seen so far. I’ve bookmarked you, for when I have time I’ll look all through your archives. Thanks for sharing your patterns. This is so lovely. I’ll get my yarn together and come join you this week end here on the web. Cup of tea and some snacks, cats and dog and see if can do this. Thank you so much for teaching it. Well these potholders are just about as pretty as can be! Thanks for the tutorial. I really love the colors you choose. One quick question. How big are these? (8-10″?). I made a pair of earrings with the pattern of the African flower (http://laubao.wordpress.com/2012/05/14/la-febbre-dei-semi-seeds-fever/)! Thank you for this post!! Hello. my name is Hanny, and I’m from Israel. I just made a potholder based on your instructions and it came out great! thank you. I’ve been asked to translate and post the insturctions in Hebrew, but I wanted to get your permission beforehand. I am hooked on making these potholders! Love them they are so simple and pretty my only thing is trying to deciede colors to use. My family are going to have alot of potholders for Christmas. Sorry to hear about your accident hope you are better. I just recently found your blog and love these potholders! Thanks for the inspiration! Working on these wonderful pot holders from Alice for Christmas gifts. I will post some pictures of my finished worked soon. Many Thanks to Alice for her great pattern and tutorial. LOVE your color choices!! I am going to have to have to learn to crochet! I featured this on my blog at http://whittskitsfabricscrafts.blogspot.com/2013/03/mining-monday-10-terrific-potholder.html with a direct link back to you. Thank you for this pattern, it’s great. My first one is just finished and I’m definitely heading for more. Thanks! I love this pattern!! It’s gorgeous!!! I just finished the front and i am amazed @ how beautiful it looks. I will finish the rest tomorrow bc it’s 2am lol I’m hooked, literally 🙂 thanks for sharing! Love absolutely!!!! Today I learned to make african flowers and this great potholder at once!!! Thanks!!! Really nice explained!! !